I’m trying to read 95 books this year and by 95 books what I mean is that I’m trying to read 62 books this year so that I can beat my 61/95 attempt from last year. And I’m not doing so well. At current pace I’m set to get through 42 books. Since this blog is about reading and running and I’ve spent a lot of time writing about running half and full marathons I feel the need to point out that the 2017 on pace to read and read so far numbers are coincidental. Honest. Anyway, at this point last year I had read 40 books, but I also read a lot at the beginning of 2016 and much less so towards the end of the year. So maybe the trend will reverse. It could happen. I didn’t know why it was called Same Diff instead of More Or Less I thought to myself while drinking a pint during Wednesday happy hour at the Three Brits (I’ve no shame) when like a lightening bolt from heaven I got it! and now I cannot remember. Probably because of the pints. Today I sat on a different patio in a different city drinking a different beer and also read Roxane Gay’s excerpt from her new (forthcoming?) book Hunger in the Guardian online and it was really good. I feel like I’m not allowed to read Roxane Gay (or Jessa Crispin or … ) in public for fear that people will think that I’m an MRA looking for ammo. Because I read social media and there are people that do. Both. Anyway, here are some numbers. 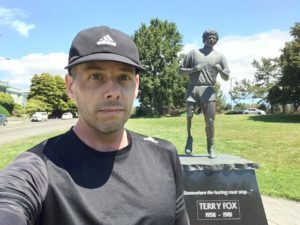 I’m trying to run 2,600 kilometres this year, which is 600 km more than last year. I have obviously done better than my reading. At this point last year I had run 917 km, which was a bit behind pace but I had a couple anomalies along the way. I hurt my knee, suffered a bought of macroscopic hematuria (the first time is the most terrifying), and I stupidly neglected to take my running stuff along on my spring sojourn in Spain. This year, knock wood, other than a nasty bought of a terrible chest cold, I’ve been rather footloose. I remember that cold. I’d never had a cold like that. As an ex-smoker I was pretty sure I was going to die. I’ve gotten to that age where every little weird but new problem I immediate think cancer. I blame the internet. But I digress. So far this year I’ve ran 1,453 km and to be on pace I would need to be at 1,300 km. I’m over 150 km ahead of pace so now I’m contemplating going for 3,000 km. But maybe instead I should read a bit more instead. Numbers! At the end of last year I set a few other goals to go along with the running and the reading, including exercising above my waist (pretty pathetic), completing six evil needlepoints (to date: zero), and figure out why I’m sick all the time and fix it. I’ve made a lot of progress on that last one since paying attention to (though not strictly following) the FODMAP Food List. So that’s good but I still have work to do on the other two. Back to work.